A couple of months ago, a friend of mine was talking about wanting to get a new porch swing. She had one already, but it was old and wooden, and she was ready for an upgrade to outdoor wicker. So when I was in the Home Depot recently, I noticed that like many of the other summer items, they had their outdoor furniture on sale. And there it was…the perfect swing sitting on the floor with an incredible price tag on it! I swear, I don’t know what we did before the invention of the smartphones, but I took a picture and texted it to her. The next day TL and I made our way back there, and fortunately, the swing was still there; and it was the last one. Even though it was already marked down, we got even more taken off the price because it was missing the bolts, which she was able to buy there, and still came out with a great savings. She offered to give me the old swing, and had even figured out how we could rig it in one of the large trees in my backyard. And under normal circumstances, I would have jumped at that offer — I say no to very few FREE things that I think I might be able to put to good use. But I said no this time, because the thought of swinging on a tree branch, with any possibility that the branch might break, just didn’t appeal to me. And, I sensed that she could probably figure out something else cool to do with old swing. 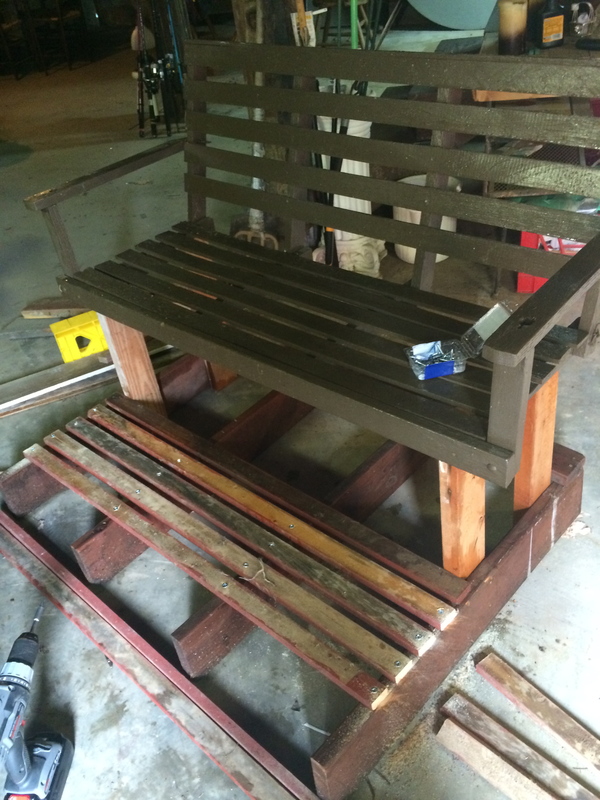 from a swing to a bench, and more! Now, TL’s swing didn’t look like this when it started. But the best part of story is how little it cost her to repurpose something she was otherwise prepared to give away. And in doing so, she created a little retreat in a corner spot of the yard that wasn’t being used. Starting first with the old swing, TL fitted it with support “legs” using wood from an old porch torn down years ago. 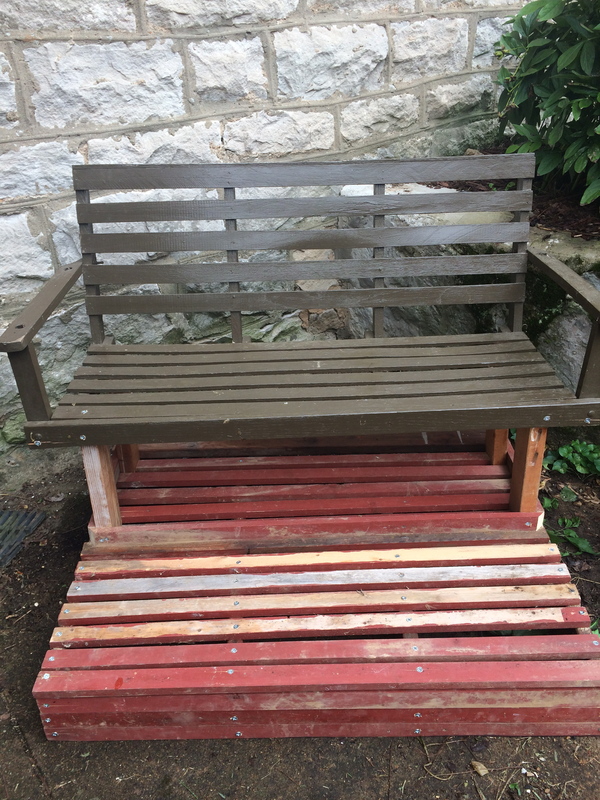 Then, after building the frame out with that same wood, she used some wooded garden stakes she had lying around; nailed everything together, and there she had it — another seating area. 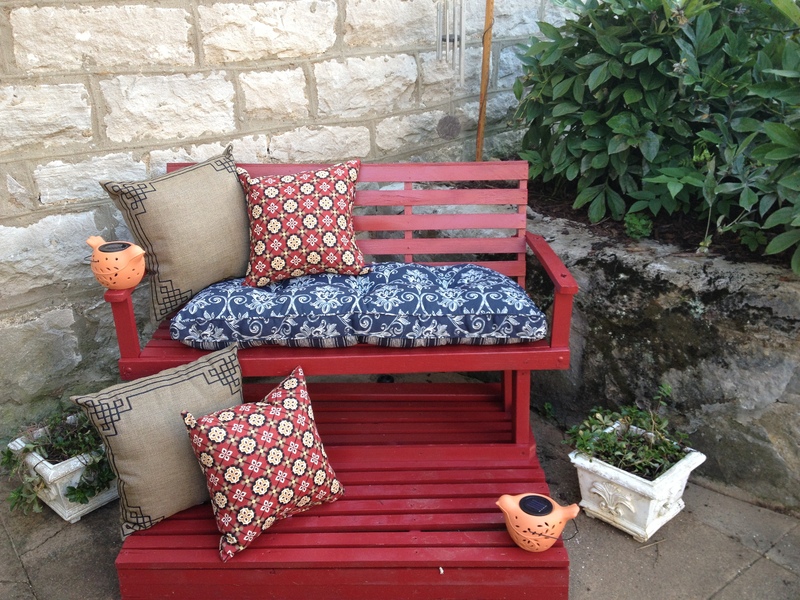 But not one to leave anything “plain Jane,” TL used an eight dollar can of red outdoor spray paint, found the seat cushion on sale for only $15.00 and accessorized further with marked down $5.00 throw pillows. The white planters were given to her by a friend just a week earlier, and the citronella candle holders were purchased the day before to use on the porch. That would have been enough for most people, but timing, and saying yes to the right things at the right time, can sometimes come together and give you way more than you bargain for. So a couple weeks before that, another friend was getting rid of a table she no longer wanted. Although TL said at the time she didn’t know what she wanted to do with it, she knew she could do “something” with it. And so weeks later, it came in handy, serving to offset the sitting area, and holding another great purchase she made at an end of the season sale — the blue water fountain. 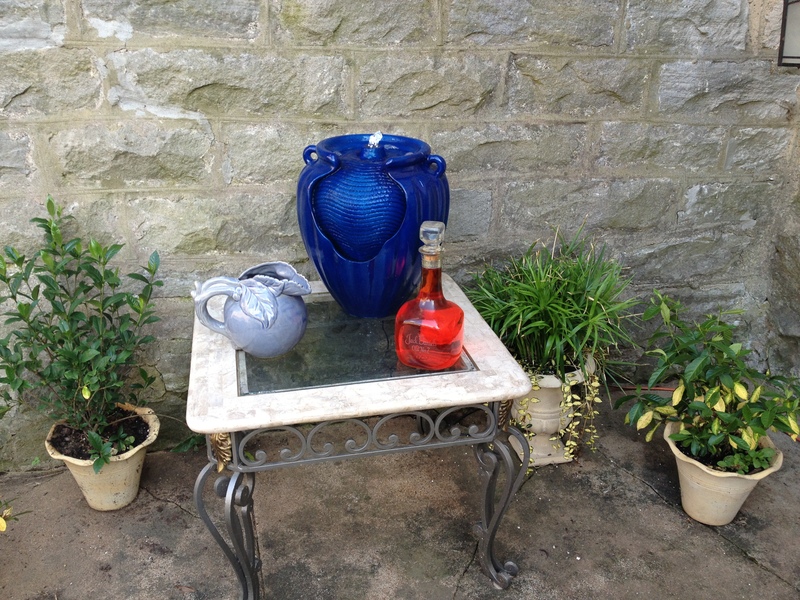 solid glass-top table holds splashing fountain and other accessories. The lighted blue fountain was regularly priced over $50.00, but was marked down for only $20! With a “shopping” trip inside the basement, a solar lantern was added to the wall and the tablescape was completed with a blue pitcher (a Christmas gift from last year) and the addition of red food coloring to a cool shaped bottle that had been sitting around the kitchen. The base of the table is surrounded by potted plants she already had. 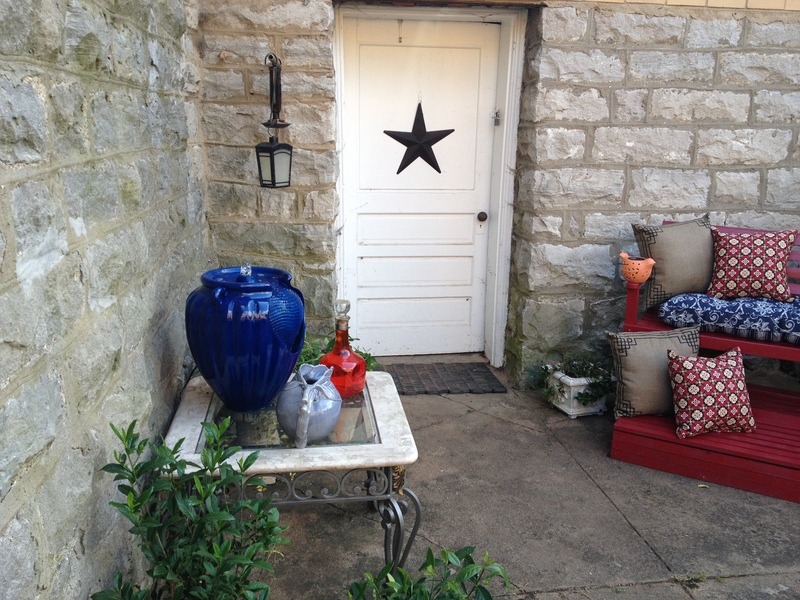 The final touches for the area was a creation of a “shepherd’s hook” she fashioned from a yard stick and wire hanger, a bird feed made from an old olive oil glass, and a metal star that previously hung in the house, to hang on the outside of the basement door. entry way into basement area, now repurposed as a reading & relaxation nook! And there you have it! Can you just imagine what something like this would have cost you in the stores?! So the next time you’re thinking about throwing or giving something away, ask yourself first, if there’s a way to repurpose it to serve another, perhaps even better place in your house. And then, let your creativity flow. And don’t forget to shop in your own home before you go out and purchase more items. You might be surprised what you already have lying around the house. This entry was posted in Saving money on September 1, 2014 by gloria green entertainment.